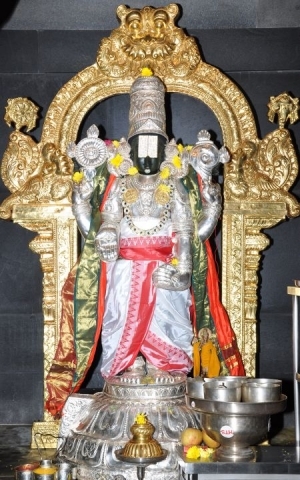 Šri Šrinivasa, or Venkatešwara, is also Šri Vishnu or Nãrãyana, and like Šri Satyanãrãyana is in a standing posture. Šri Venkatešwara is believed to erase our sins and also bless us by granting boons. The usual blessing in the shrine of Sri Venkateswara is the distribution of sacred water (teertha) to devotees and the placing of the dome shaped shatãri on devotees’ heads. The “shatari” has images of two feet on the top representing the sacred feet of Šri Venkateswara reminding us that when we unconditionally and totally surrender to Him our minds will be rid of mundane attachments and the way to liberation will be paved.